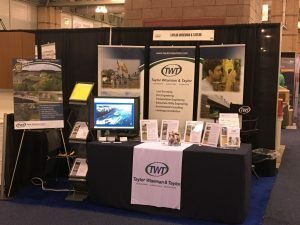 Once again, Taylor Wiseman & Taylor showed support for the building industry, attending the 68th annual Atlantic Builders Convention held April 4th-6th. Thousands of building industry professionals made their way to Atlantic City for the 2017 Conference and Expo. The annual Atlantic Builders Convention began with a tour of Atlantic City given by Mayor Don Guardian, Planning and Development Director Elizabeth Terenik, and Licensing and Inspections Director Dale Finch. NJBA members were able to visit several active development sites that are changing Atlantic City’s economy and landscape. The group visited the AC Devco Gateway (Stockton University and South Jersey Gas headquarters); ACPD Public Safety Building Surveillance Room; the Steel Pier; the Beach at South Inlet; and the Flagship Inlet Boardwalk and Seawall Project. During the NJBA Annual Board Meeting, NJBA presented Immediate Past President Dwight Wesley Pittenger, Esq., with a plaque commemorating the successful passage of the 5th Permit Extension Act, along with a statue of Rodin’s ‘The Thinker,’ in recognition of his dedication to the association and his thoughtful leadership throughout his term as President. Patrick Kane, Vice President of Taylor Wiseman & Taylor, is an Associate Member of the Board. Following the Annual NJBA Board meeting, John H. Kirkenir of Alliance Homes, LLC was installed as President of the New Jersey Builders Association. 300 exhibitors attended ABC to showcase their latest products and services. Taylor Wiseman & Taylor’s exhibit booth, which featured our Drone Aerial Imagery Service, was staffed by Pat Kane, Tom Wingate, Sam Previtera, Gary Vecchio, Ed Brady, Rich McGuire and Bill Ommundsen. New on the exhibit floor this year was the Green Neighborhood, developed in partnership with NJ Future. At ABC, NJ Future and NJBA released the new Developers’ Green Infrastructure Guide. The guide is designed to help developers answer basic questions about green infrastructure, including what it is, how it works, its costs and benefits, and why it makes good business sense. It includes case studies, side-by-side site plan comparisons, and interactive decision-making tools. A big part of the conference is the Annual Economic Forecast & Builder Panel. The Economic Forecast featured an introduction from NJ Senate President, Steven Sweeney, who presented Immediate Past President Dwight Wesley Pittenger, Esq. with a Joint Resolution from the NJ Legislature, honoring his term as President of NJBA.